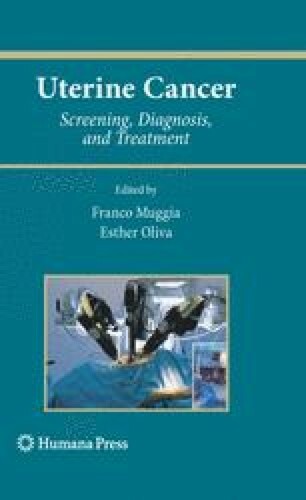 The central epidemiologic features of cancer of the endometrium are the much increased risk associated with obesity, evident both in premenopausal and postmenopausal women, the decreased risk with increasing parity and increasing duration of use of oral contraceptives (OCs), the increased risk with menopausal estrogen therapy (ET), and the sharp slowing down in the rate of increase in endometrial cancer incidence with age around the time of menopause. Sequential menopausal estrogen–progestin therapy (EPT) with the progestin given for 10–12 days per 28-day cycle is still associated with an increased risk, although of a much smaller magnitude than that associated with ET. Continuous-combined EPT is not associated with any increased risk and may be associated with a decreased risk. These phenomena are readily explained by a simple unopposed estrogen hypothesis, by which estrogen unopposed by a progestin increases risk. The basis for this hypothesis is that estrogen unopposed by a progestin increases cell division rates in the endometrium. Considering the relationship between endometrial cell proliferation during the menstrual cycle and the diminishing effect of ET with increasing body mass index (kg/m2), it is possible to found that there is a relatively low ceiling of biologically available estradiol (E2), ˜10.1Â pg/ml, beyond which no further increase in endometrial cancer risk occurs. On the basis of this information, one would predict that reducing the standard dose of ET by as much as one half will produce little or no reduction in the risk of ET.